Join our Referral Program and each time you show your Oliver to a potential customer and they purchase a new Oliver from us, you will earn a $250 Cash Referral Reward! Earn a $250 Referral Reward for showing your Oliver! 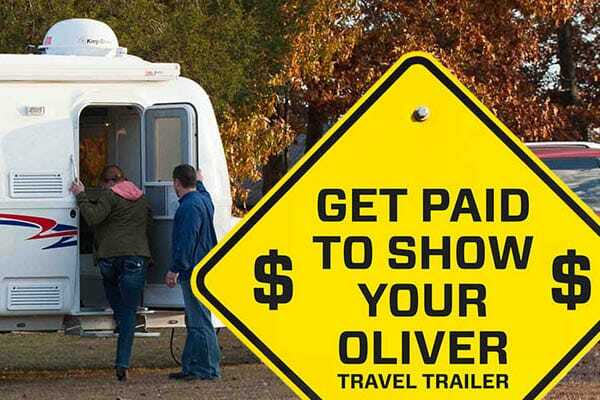 Regardless if you found a prospective owner yourself, they found you or if Oliver arranged the field visit, anytime you show your trailer to a prospective customer, you can earn up to a $250 cash Referral Reward if that person purchases a new Oliver. Our Field Visit Coordinator will set-up and help to make arrangements for the Ollie viewing. Once the field visit has taken place you will need to mail us a Referral Card with details of the field viewing or you can submit a Referral Card online. If the person purchases a new Oliver, we will reward you with a $250 check for just showing off your Oliver. Super easy! Note: Referral Rewards may occasionally be split between owners when the prospect views multiple trailers before purchasing a new Oliver. Note: According to US tax codes we must issue a Form 1099-MISC to each person to whom we have paid at least $600 in rents, services (including parts and materials), prizes and awards, or other income payments. Payments made under this referral program will be subject to reporting. How do I Opt-In or Opt-Out from the See An Oliver Referral Program? You can opt-in or opt-out of the Oliver Referral Program simply by using the Update Referral Program Form found by clicking the button below.